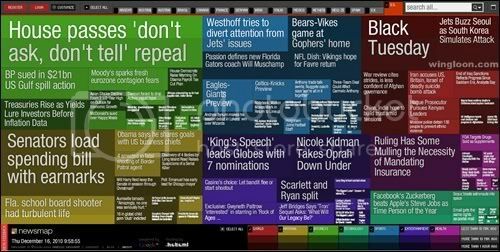 Newsmap, a web application tool that let you visualize Google News in a big landscape type on your screen. With Newsmap, you can manipulate the view of news by country as well as category. You can have your choice of flavors effect to view your news by selecting combination across several countries and categories. News which given the most coverage can be an easy eye catching to users as compare to viewing conventional news aggregator. A simple mouse over to the news, a small pop-up will give you a summary and image of the news. Clicking on the target news square box will redirect you to the news source. However, you can further customize your daily viewing of news at Newsmap by registering a free account like hide clicked articles, toggle display previews, changing of font type, changing of map colors and toggle of preferred countries. Reading news is not bored with Newsmap anymore. Thanks to Jolicloud for featuring Newsmap. Perhaps, how about putting up Newsmap on a big LCD panel.